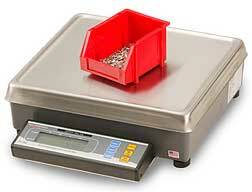 An easy-to-operate, no nonsense counting scale that weighs extremely light parts and reduces the time required to count. The PC-902, using vibrating beam technology provides the highest level of counting accuracy, at an affordable price. Yellow keys draw the operator’s attention to the 3 most used keys – ZERO, TARE and SAMPLE. Printer Ready: 3 standard print formats each for use with Zebra LP2844, Dymo Costar, Setra 3 label printers. 8 standard print formats available for use with Avery Weigh-Tronix Dot Matrix printers.